Default zero constructor, optionally specifying t, the type. Constructor with complex numbers specifying the components, optionally specifying t, the type. Subscript operator to return spinor components. Standard Lorentz boost specifying the components of the beta vector. Standard Lorentz boost specifying the beta vector. Return the type of the spinor. The LorentzSpinorBar class implements the storage of a barred LorentzSpinor. The design is based on that of the LorentzSpinor class where the details of the implemented are discussed in more detail. Definition at line 35 of file LorentzSpinorBar.h. Return the conjugated spinor . 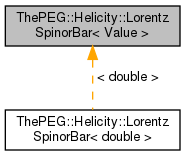 Referenced by ThePEG::Helicity::LorentzSpinorBar< double >::setS4().